This is your day! Make a bold, beautiful statement of eternal style with the Corral A3550 boot! Ideal for weddings, but designed to be worn anywhere! Lightly crackled leather upper with gorgeous floral cutouts with eye-catching glitter underlays. Pull-on shortie boot with sturdy leather pull straps. Leather outsole with floral tooling and a rubber heel cap. The base features rustic rope trim all the way around the base and a custom engraved wooden heart with your initials. This romantic couple features your classic cowboy dancing the night away with his lovely bride. The cowboy is dressed in weathered blue jeans with a black jacket and matching boots and hat. This couple is hand painted porcelain and will make a timeless keepsake after you wedding day. Customized with your choice of monogram letters and bride/groom hair colors. This adorable western figurine is slow-dancing their way into married life. Features the groom wearing a cowboy hat and blue jeans. Hand painted porcelain. *your custom choice of bride and groom hair colors in these figurines. This romantic couple features your classic cowboy dancing the night away with his lovely bride. The cowboy is dressed in weathered blue jeans with a black jacket and matching boots and hat. His beautiful bride has her head resting on his shoulder. She carries a white bouquet with white flowers in her hair. Her dress is completely glazed. The couple are tied with a rope lasso ending in a bow. This couple is hand painted porcelain and will make a timeless keepsake after you wedding day. They are decorated by tow delicate paper flowers and the base is covered in a French canvas and rope trim. *custom choice of bride and groom hair colors. 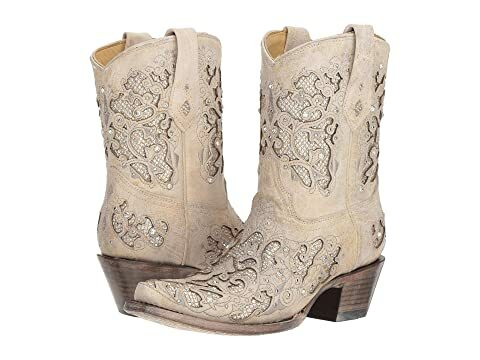 These gorgeous boots are part of Corrals Bridal collection. From this day forward, today I marry my best friend. Perfect gift for cowgirls and cowboys getting married. Measures 12” W x 18” H.